Heroes don’t always come in uniform. Set in the 1980s, we follow a fearless IT officer as he carries out a non-stop raid at the mansion of the most powerful man in Lucknow, despite all the attempts by the latter to get the officer removed. Will he manage to stop the raid or will the officer bring him down? 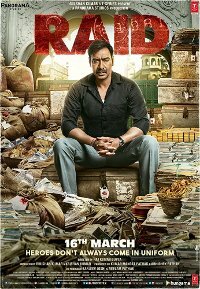 The film is based on one of the most high profile raids India has ever known and is the world’s first film on the subject of income tax raids. In Hindi language with English subtitles. Action, Crime, Drama, Thriller, Bollywood.